A blog I have created to record interesting ConfigMgr and Powershell information I find. 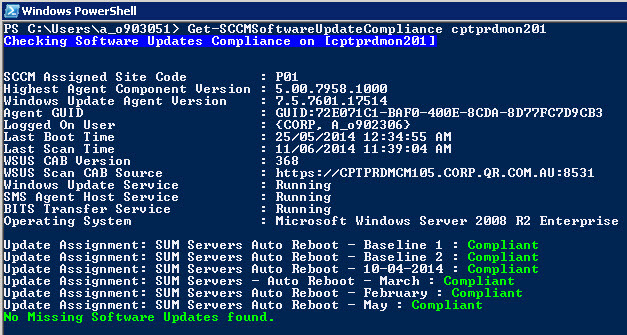 Below is an update module I have previously published to now work against SCCM 2012 R2 agents. Checks a ConfigMgr client for required Software Update compliance. Checks a ConfigMgr client for required Software Update compliance, if it is found non-compliant for any assigned security updates the list of updates is returned. The server name to target. PS C:\> Get-SCCMSoftwareUpdateCompliance -ComputerName "Foo"
$SiteCode = "No Site Code Assigned"
$User = "No User Logged On"
#loop through updates and get the details. Unfortunately SCCM 2012 still has a requirement to manually remove expired and superseded updates. Quite sometime ago I found and modified Trevor Sullivan's Powershell script for use with SCCM 2007. As I have just build a new SCCM 2012 R2 environment for a client I decided I would spend the time to update the script for use with SCCM 2012. Note: By removing superseded updates via this script I would assume that the newer superseding updates are being included in new deployments. Updated the script to a parameterized advanced Powershell script. Updated to enable targeting of remote primary site servers. Updated to only trigger a DP refresh for packages which have had updates removed. 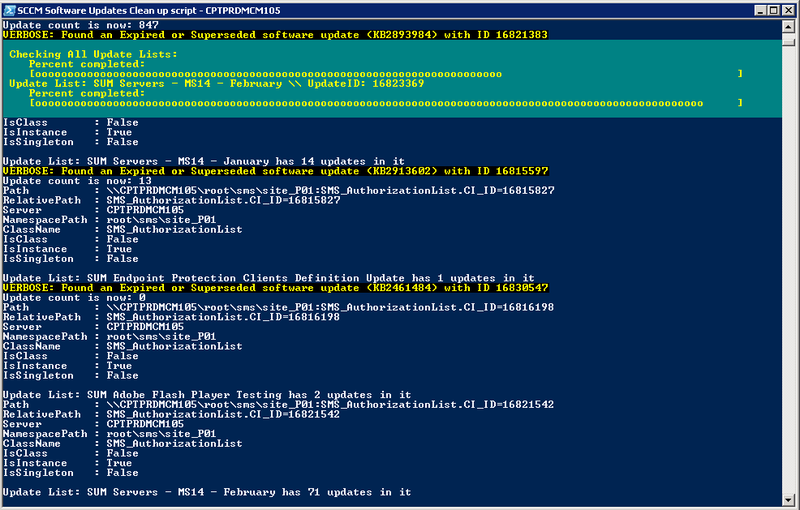 Commented out the 'SMS_UpdatesAssignment' (Deployments) code section as updates listed in this WMI class now appear to automatically mirror the updates contained in the associated 'Software Update Group' so do not need to reviewed\updated. 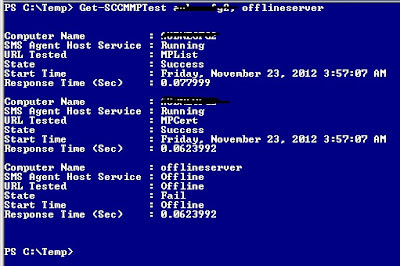 Added the use of Powershell transcripts for basic logging. Distribution Point refresh is triggered for packages which have been modified. Note: If no server name is specified you will be prompted to provide one. Within the organization I currently contract too SCCM is utilized for the deployment of monthly Microsoft patches and to report on compliance through monthly and quarterly 'Update Lists'. 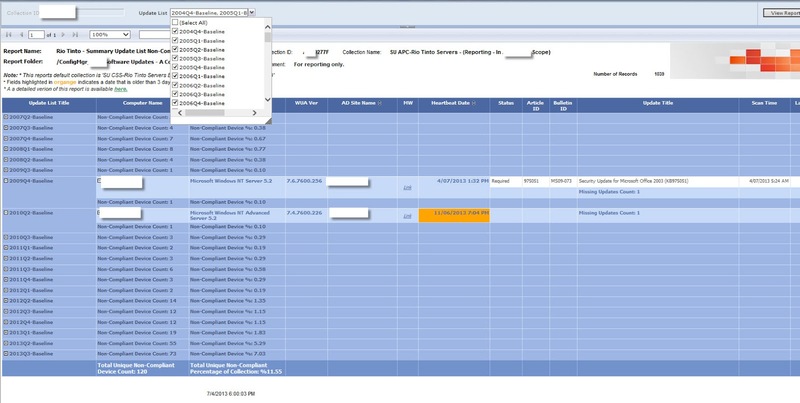 To assist regional server and desktop teams track compliance of assets they manage against these update lists I have created various SSRS Reports, this is the first one I will be blogging about. My goal was to enable support teams to easily specify the CollectionID which groups the assets they are responsible for and select one or more update lists to easily identify which machines have not reached a compliant state. I have tried to include other key pieces of information which are directly related to this kind of a analysis such as the windows update agent version, heartbeat, scan date and a link to another report for all available maintenance windows for the machine. In addition to grouping all key information for reporting compliance on a per machine basis I have tried to immediately assist teams with their analysis by automatically highlighting when a heartbeat date or scan date is more than three days old. I also highlight when the windows update agent version is below a minimum known good version for SCCM 2007. These indicators should be investigated as a matter of priority, i.e. 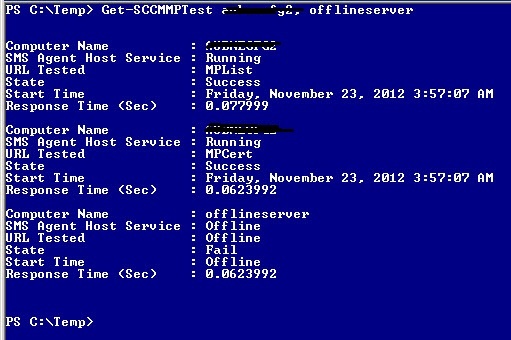 if the heartbeat is aged then local SCCM agent service is either stopped\offline or the agent is generally unhealthy. It is important that the role of the scan date\data is understood clearly by teams performing troubleshooting. I have seen it many times where server teams see a non-compliant server so believe that by manually installing an update this will immediately result in a compliant state. Support teams must understand that the scan process is not only utilized to determine update applicability locally on the machine but also all parent SCCM site servers in the hierarchy will independently calculate the compliance state for the machine based on the submitted scan state data. Simple drop down selection criteria for SCCM deployments and deployment collections. More complete overview of key information for each stage of the deployment of updates. Near real time, changes are dependent on inter-site replication and the scan state submitted by client agents. Ideal for drill through links to specific custom and default SCCM reports to display more detailed information on devices in a specific state. All that should be required to get this report working in other environments that already have SSRS available is to upload the RDL and use Report Builder to modify the server details to point to their SCCM SQL database server name and database name. Another report which displays the same data but in a Excel friendly table format. Please feel free to post a comment if you are unable to get the report working successfully. Tuning SCCM 2007 & 2012 Site-to-Site Replication with Thread Settings. For the longest time I continually listened to people referring to SMS\SCCM as 'slow management server' and for a while I agreed, that is until I discovered the settings that I believe can dramatically improve the time it takes to replicate configuration changes throughout a multiple site the hierarchy. I have looked around on the web and spoken with a Microsoft PFE and there does not appear be any publicly available guidance from Microsoft on best practices for tuning site and software distribution thread settings. The approach I outline below was discovered more through trial and observation that anything else and so your mileage may vary if applied to your environment. Fig 1. Multiple concurrent active package distributions and metadata replication backlogging indicating possible thread misconfiguration. Notice in Fig1 the relationship between the number of concurrent package distributions (below) and the minor backlogging in the Schedule.box\outboxes\lan inbox (above). 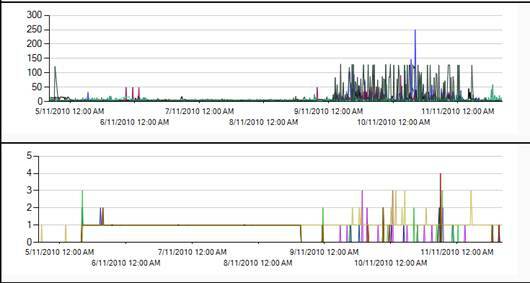 Once the active package distributions completed the backlogging would clear almost immediately. This was due to software package distributions consuming all available threads for a child site resulting in normal site-to-site metadata replication to backlog. Ideally with the all thread settings tuned correctly both package distributions and site to site metadata changes will flow concurrently with neither adversely impacting the other. Fig 2. The results of tuning thread settings, note the sharp drop in the top graph immediately post change. 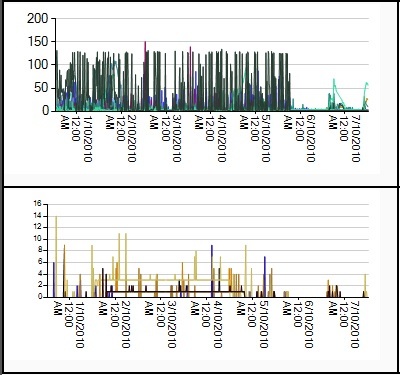 Notice in Fig 2. that as soon as the four configurable thread settings were tuned, we immediately saw a noticeable reduction in metadata backlogging which has improved the efficiently of site-to-site communication and reliability of package distribution. The graphs above represent a second tier primary site which has over a dozen child primary and secondary sites supporting 25k clients under normal load conditions. Historically the expectation was that configuration changes could take hours or days to replicate to the lowest site tier (5 levels) however after tuning these settings the average is now 15 minutes or less for a change made at the central site to fully replication to all sites globally. This has also had a positive impact on the upstream replication of client 'state' and site 'status' messages. 'All Sites: Number of directly connected child sites multiplied by 10 threads. Note: The above assumes three directly connected child sites. i.e. 4 Max number of concurrent packages distributions multiplied by 2 threads per package = Software distribution (Packages) is limited to a maximum of 8 threads, thus always allowing 2 spare threads for site-to-site replication. The above settings will result 2 spare threads per site to always allow site-to-site configuration\metadata to flow and not be blocked by any active package distributions. Rate limiting on addresses should be avoided as its use results in only 1 thread being available for site to site metadata replication and package content transfers. Where ever possible rely on other networking technologies such as QOS or Riverbeds to manage WAN link utilization. Sender ‘Maximum Concurrent Sendings’ thread settings should be set based on the number of directly connected child sites and reviewed periodically. Sender thread settings per site should exceed by at least 2 threads what is configured for package distribution to allow headroom for site to site configuration metadata replication to always occur. As a result of the above tuning, issues or abnormal inbox traffic trends are much easier to identify. Disclaimer: The above has been tested in a 60k production SCCM 2007 environment. 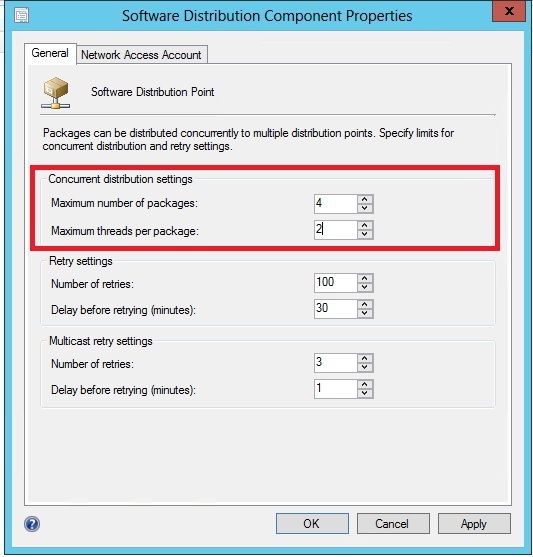 ConfigMgr 2012 has the same configurable settings so I assume the same principles can be applied. PowerShell - Find SCCM agents that are in an 'unknown' state in DCM reporting. I regularly find myself having to remotely start the SMS Agent Host service on site servers and found it annoying to have to open an internet browser just to test the SCCM management point URL's. So in an effort to save time I wrote the following PowerShell module to enable me to easily remotely check the availability of the management point for one or many servers from the command line. The example screen capture below displays the default set of results however if you pipe to 'Select *' then you can additionally see the same page content that would have been displayed in the Internet Explorer, such as the certificate value and child site listing. The computer name to target. PS C:\> Get-SCCMMPTest -ComputerName "Foo"
$Results | Add-Member -type NoteProperty -name "State" -value "Success"
$Results | Add-Member -type NoteProperty -name "State" -value "Fail"
$Results | Add-Member -type NoteProperty -name "SMS Agent Host Service" -value "Offline"
$Results | Add-Member -type NoteProperty -name "URL Tested" -value "Offline"
$Results | Add-Member -type NoteProperty -name "Start Time" -value "Offline"
PowerShell - Refresh content on all DP's assigned for a package. Whilst debugging a large SCCM software updates maintenance script I needed to determine how to refresh the content on all assigned distribution points after an update had been removed from a package. The below code will trigger a distribution point refresh on all assigned DP's immediately. When I get time I will look to turn this command in to a module for easier reuse and piping.